When Samsung said that they’ll aggressively approach the tablet market, they weren’t joking. 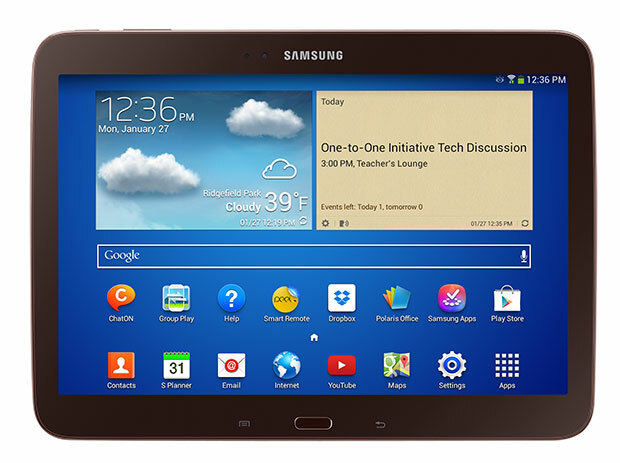 Just now, Samsung in the United States announced a new Galaxy Tab variant meant for schools. It’s basically a Galaxy Tab 3 10.1-inch but with education-centric features. Hardware-wise, users will find a 10.1-inch WXGA display, Wi-Fi, NFC and cameras on the Android 4.4 KitKat running tablet. However, it’s the education side that differentiates this variant with the retail one. This tablet is part of Google Play for Education that will give access to Google’s content store for K-12 students. It will also have teacher-approved apps, books and videos, option to purchase from school PO instead of credit card and even a web-based management console for easy management. There’s no information on the price but Samsung expects to release the tablet in April and will be available for K-12 deployments for academic year 2014-15. They should’ve used the Galaxy Note 10.1 2014 instead. The S-Pen features are a must have for students..
exactly! There is already ipad, we dont need another useless tablet. This is a fail, as usual. Without a pen, tablet is useless in education. And if this a tab3, why did they do ANOTHER variant!? We dont need multible variants either. If we want tablets, they will be ipads. Sorry Samsung, you did it wrong again, failed! But I suppose this will only be specific to the U.S.